Currently, in a Maven Project, fingerprints are generated for all build artifacts (created and used). In a freestyle project, you can manually select files to be fingerprinted using the Fingerprinter publisher. This needs to be possible for Maven Projects, too. 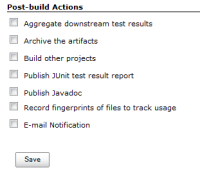 Consider for example a Maven project that uses post-build steps to create additional artifacts. You can archive them (without them being fingerprinted), but you cannot choose to fingerprint them. Looking at hudson.tasks.Fingerprinter, I see no reason why this publisher should not be available for configuration. If you enter the publisher by hand into the config.xml of a job, it works (until you reconfig that job, of course), so this seems to be a display issue. One small drawback: two fingerprintActions are included. the second part is trivial, I can create a pull request for that. JENKINS-19712 [Fingerprint] Excessive Heap consumption during "Waiting for Jenkins to finish collecting data"
The fix to Fingerprinter was already done in JENKINS-17606. Jesse Glick added a comment - 2014-05-21 21:16 The fix to Fingerprinter was already done in JENKINS-17606 . [FIXED JENKINS-11333] Allow users to disable automatic fingerprinting, but add in explicit fingerprinting if desired. SCM/JIRA link daemon added a comment - 2014-05-21 22:34 Code changed in jenkins User: Jesse Glick Path: src/main/java/hudson/maven/MavenModule.java src/main/java/hudson/maven/MavenModuleSet.java src/main/java/hudson/maven/reporters/MavenArtifactArchiver.java src/main/java/hudson/maven/reporters/MavenFingerprinter.java src/main/resources/hudson/maven/MavenModuleSet/configure-entries.jelly src/main/webapp/fingerprintingDisabled.html src/test/java/hudson/maven/MavenModuleSetTest.java http://jenkins-ci.org/commit/maven-plugin/33c52c897e893029631615cc5bebacd15d535454 Log: [FIXED JENKINS-11333] Allow users to disable automatic fingerprinting, but add in explicit fingerprinting if desired. Does this address https://issues.jenkins-ci.org/browse/JENKINS-18615? Is there a target version for this enhancement? Joseph Benken added a comment - 2014-07-02 20:50 Does this address https://issues.jenkins-ci.org/browse/JENKINS-18615? Is there a target version for this enhancement? @benken_parasoft yes and it has been released. Jesse Glick added a comment - 2014-07-03 21:22 @benken_parasoft yes and it has been released.